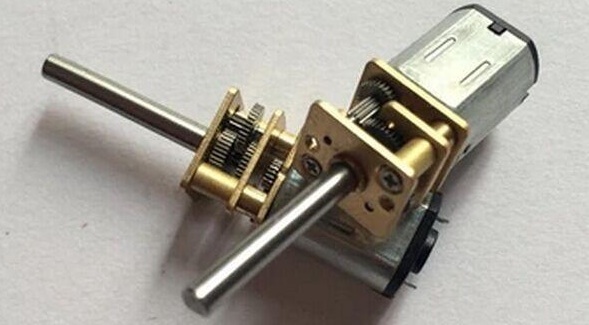 DC GEAR MOTOR 12V,1000RPM of Miniature DC Motor Metal Gear Box With 20mm Length D Shape Shaft Diameter1000 RPM 12V DC Geared Motor is high quality low cost DC geared motor. It has steel gears and pinions to ensure longer life and better wear and tear properties. The gears are fixed on hardened steel spindles polished to a mirror finish. The output shaft rotates in a plastic bushing. The whole assembly is covered with a plastic ring. Gearbox is sealed and lubricated with lithium grease and require no maintenance. The motor is screwed to the gear box from inside.Although motor gives 1000 RPM at 12V but motor runs smoothly from 4V to 12V and gives wide range of RPM, and torque. 6mm diameter shaft section, shaft length 17 mm. 6 M3 screw holes on the front side are available. No load current is 240ma, and stall current is 5.9 Ampere! All Gearhead gears are metal. Motor’s stall torque is 7.5 kg-cm.